You looked up streaks The Captain has had before that were this good, but has this year now surpassed those in length? He means David Wright, for what it’s worth. And yes, it has. In a couple of earlier posts, I looked up whether Wright had any hot stretches in any of his disappointing seasons from 2009-2011 that, if isolated by arbitrary endpoints, match the production he has put up to open the 2012 season. There were 33- and 38-game stretches that matched this hot start, but by my best digging on the baseball-reference gamelogs, I can’t isolate a 41-game stretch from any of those years in which Wright was this good for this long — at least if you consider Wright’s lack of strikeouts along with his hilarious production. 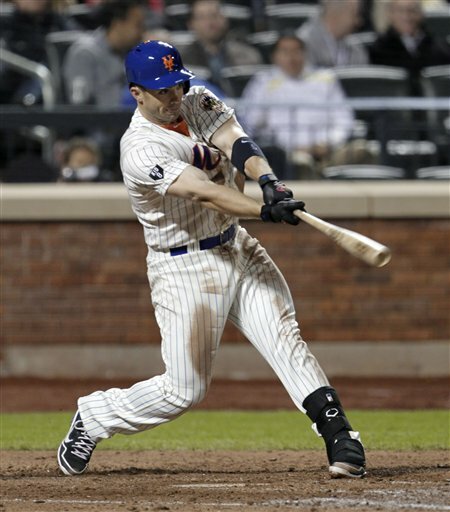 In fact, the last time I can find that Wright was this hot was back in his MVP-caliber 2007 campaign, when he posted a .379/.500/.662 mark from the second game of a July 28 doubleheader through Sept. 12. And though Wright hit 10 home runs over that stretch and it was less fueled by batting average in balls in play, given the distinctions in hitting environments and league-wide offensive standards it seems reasonable to contend that an 1.128 OPS today is at least impressive as a 1.162 OPS in 2007 (to boot: Carlos Beltran’s .904 OPS with the Mets in 2011 produced a 152 park- and league-adjusted OPS+ whereas his me-first .982 OPS in 2006 yielded a 150 in the same stat). Which is to say something you may have noticed: Wright’s first 41 games in 2012 represent about the best we’ve seen of the man. And it is, you may also have noticed, pretty spectacular. As for calling Wright “The Captain,” this is confusing for a bunch of reasons. For one, to me “The Captain” will always refer to The Captain Dog (more frequently known simply as “Captain” or “T. Captain Dog”) my late, lovably dumb, giant-headed Scottish Terrier. Alternately, it might also refer to Captain Morgan or Kirk Nieuwenhuis. Should the Mets name Wright their captain? I guess? If someone could tell me anything specific that a baseball-team captain does that David Wright doesn’t already do, I might be more adamant about it. He gets to wear a little “C” on his jersey? Symbolic gestures are nice, but I suspect the best way to indicate to Wright and Mets fans that the team is committed to him as a leader and player is to pony up for a long-term extension, which seems pretty likely anyway. Carlos Beltran leading the league in homers while not an upcoming free agent, how does this selfishly benefit him? Beltran has figured it out, Tyrion. He knows that we know he’s only playing for his next contract, so he’s playing really well in a non-contract year as misdirection so it doesn’t seem suspicious when he plays really well in a contract year. He pulled the same act with the Mets in 2006, 2007, 2008, the first half of 2009, and the last month of 2010. It’s utterly depraved.